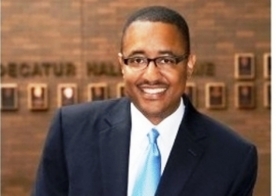 July 11 – Billy Tyus will take over the role of Interim City Manager if the Decatur City Council approves his appointment at its next meeting Monday. Tyus, who has served as Deputy City Manager for more than a year, would fill the vacancy created by the departure of Tim Gleason, who is moving on to become the City Manager in Bloomington. The City announced the decision Thursday afternoon. Tyus has more than 22 years of public and private experience in government, media community engagement and economic development. He has spent nearly 18 years working for the City of Decatur. Under Gleason’s direction, Tyus has taken on an expanded role over the last several years, having been more directly involved in the overall administrative operations of the city. The City Council plans to hire a search firm to help locate a permanent city manager. More details on the search are expected in the near future.